In the previous post I provided a translation of Hebrews 9:16-18 which is different than what is officially published in English translations. In order to illustrate the significance of the difference between translations, I would like to present three different angles from which that text can be viewed. Therefore he [Jesus] is the mediator of a new covenant, so that those who are called may receive the promised eternal inheritance, since a death has occurred that redeems them from the transgressions committed under the first covenant. For where a will is involved, the death of the one who made it must established. For a will takes effect only at death, since it is not in force as long as the one who made it is alive. Therefore not even the first covenant was inaugurated without blood. For when every commandment of the law had been declared by Moses to all the people, he took the blood of calves and goats... saying, "This is the blood of the covenant that God commanded for you." First, notice carefully that this translation is arguing about a new covenant, not a new will and testament. A will and testament are synonymous terms, and they are legal documents which detail the wishes and desires of the author to be enacted and provided upon the author's death. A covenant, on the other hand is something different according the Bible and in the mind of the author of Hebrews everywhere else in this letter, even though technically a will and testament is a type of covenant. A covenant, theologically speaking, is "a mutually binding compact between God and His people sovereignly transacted by the Lord wherein a promise is made by God which calls for trust on the part of His people and entails obligations of submission which are sanctioned by blessings and cursings"1 In the context of Hebrews, the author is describing the necessary change of the old covenant in matters pertaining to its laws of priesthood, and by extension its sacrificial system. And so, the sudden transition from "covenant" to a "will" or "testament" seems completely out of place and unnecessary. My own personal opinion is that not only is it unnecessary, but the author committed a blatantly logical fallacy of equivocation -- not simply a conveniently random use of word-play -- if he was indeed shifting from "covenant" to "will" within the premises of his argument, before reaching his conclusion about the blood of calves and goats as "the blood of the covenant that God made for you". The feather in my hand is light. And we all know that whatever is light cannot be dark also. Therefore, the feather in my hand cannot be dark. Would anyone seriously consider this to be a valid method of argumentation? Of course not, because the word "light" is used equivocally. In the first premise, "light" is being used to describe the feather's weight, not it's color or brightness, even though "light" can carry both meanings. Sure, it's word-play too, but it's also a fallacious way of reasoning. And this is how I see modern translations of Hebrews 9:16-17 when they use the word diatheke. The author of Hebrews uses diatheke with a very clear meaning of a "covenant" throughout his letter. But supposedly the author has a good reason for shifting away from that meaning and to argue with that same exact word (diatheke), but with a different meaning instead: the meaning of a "will" or "testament". Then, of course, within the very next sentence, the author goes back again to using diatheke in the sense of a "covenant", which is used everywhere else in the letter except 9:16-17. In context, it seems obvious that the author begins by mentioning a "first covenant (diatheke)", and then he follows through with a few more details about this diatheke (i.e. "covenant", or allegedly a "will") before reaching a conclusion about "the blood of the covenant that God commanded for you." This sudden shift from covenant to will to covenant again smacks of something very odd every time I look at modern translations. Now, some scholars have suggested that this translation makes no sense because we know that Israelites made covenants all the time under the old covenant. In fact, every time they went to offer a sacrifice they were renewing their covenant obligations with God, and none of them died or were even required to die! But here the author of Hebrews teaches that those acts of covenant renewal were not in force as long as the one who made it was alive. Therefore the conclusion has been that "the one who made the covenant" must not be describing the worshiper, because he remains alive while renewing his covenant. Instead, the author is performing word-play with diatheke, knowing that the same word can mean both "covenant" and "will" or "testament". And so, where a "will" is involved, the "death of the one who made it" can be viewed as the death of Jesus, not the worshiper. But is this really a reasonable charge against this translation? Even if my translation (below and in the previous post) appears at first glance to be unrealistic, I am going to argue that it is very realistic within a context about the old covenant model of priesthood and animal sacrifice, which I believe the author also had in mind (as is obvious from the context itself). If the author is describing the temporary, old covenant administration of worship in which animals represented the worshiper, as well as the priesthood which mediated between God and the worshiper, this consistent translation of "covenant" makes perfect sense. For where a covenant is, it is necessary that the death of the institutor be carried. For a covenant is established upon dead victims, otherwise it is of no strength at all while the institutor is alive. Therefore not even the first covenant was inaugurated without blood. With the sacrificial system in mind, this translation seems natural. 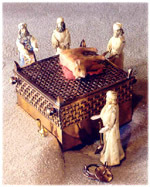 A worshiper under the old covenant ministry and priesthood would enter the tabernacle with an animal to represent him. He would lay his hands on the animal representing him, and then he would slaughter the animal. The priest would then carry the dead body of the animal (representing the worshiper) and it's blood into areas which the worshiper himself was not allowed. And it was because the worshiper presented an animal before God to die in his place (representatively, as prescribed by the Lord), and that there was a priest (as prescribed by the Lord) present to carry his dead body into the presence of God, that the worshiper was able to renew his covenant with God. 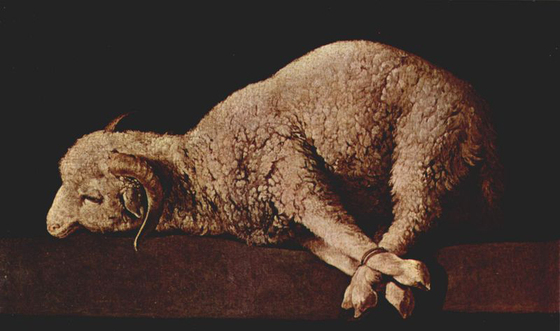 The whole purpose of priests carrying dead animals into God's presence and sprinkling their blood for atonement was to teach the worshiper what they deserve, as well as their need for a priest to mediate between themselves and God. For where a covenant is, it is necessary that the death of the institutor [of the covenant] be carried [by a priest]. For a covenant is established over dead [animal] victims, otherwise [the covenant] is of no strength at all while the institutor is alive. Therefore not even the first [covenant/priestly ministry] was inaugurated without blood. In order to provide further support for this translation, I will need to present more evidence in its favor in a future post. I still need to discuss why I include the phrases "be carried" and "over dead victims" in my translation. But like I just mentioned, I'll be saving that for a future post.